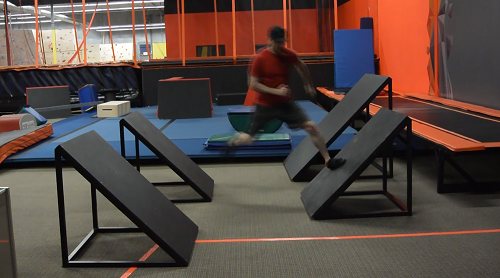 I believe that a variation of the quad steps makes it onto every iteration of Ninja Warrior, and I don’t think Australian Ninja Warrior will be any different… so it’s important to know how to best tackle the first obstacle you’ll likely hit. The quad steps is such a classic obstacle because it looks so easy, but when you’re there and the nerves have kicked in, it’s actually super tricky. There are 3 different ways to tackle the quad steps, and a wily competitor could switch methods depending on the situation. The first method is the safest, and the least spectacular looking. It’s called the Cat Grab. It’s where you jump to each platform with both feet and grab the top of the panel. It’s definitely the safest because you have 4 points of contact with each panel, and you can push off on your strongest leg regardless of how far through the obstacle you are. This method is slow, but secure. 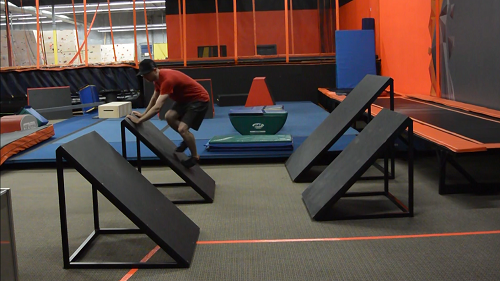 You won’t break any time records but you should have a great chance to make it to the second obstacle. Anyone new to Ninja Warrior, I would absolutely recommend this technique. The second method is kind of between the cat grab and the single step. It’s all the triple step approach. You jump to the first platform and land with one leg, immediately put your other leg on the platform and then push off with the leg you originally landed on. It’s called the Triple Step because you step on each platform 3 times, land first foot, land second food, push off with first foot. The reason you use three steps is that keeps your outside foot in the strongest position for landing and pushing off. If you only used two steps you’d have to cross your body when you leap, which throws off your balance. The triple step approach also puts your body in a good spot to grab onto the edges like the Cat Grab if you start to lose it. This method is the most obvious…. you leap from one step to another, placing a single foot on each panel. This is the most dangerous approach and by far the quickest. You make sure that your body is evenly placed between the panels and you leap from one panel to the next just using the ball of your foot and your toes. Keep your momentum forward. There are a couple of problems with this approach. One; it’s actually surprisingly hard… your legs do start to tire really quickly. Secondly, because the steps are over water, and the water sways and moves as water does, it actually throws off your perception a little bit. 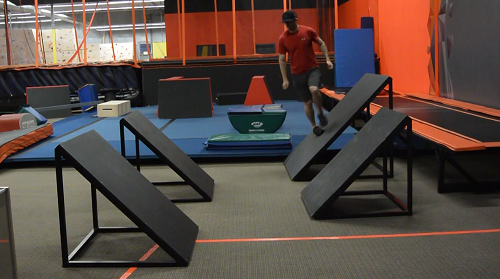 Competitors that can do the quad steps 99 out of 100 times on dry land sometimes completely mess up the obstacle when their eyes catch the sway of the water. Thirdly, speaking of the water, if someone heavy has gone before you, and has splashed the steps, then only placing the ball of your foot doesn’t give you a lot of room to recover if you slip. They do wipe down the obstacles between runs, but you still can’t depend on it being completely dry. I’m not saying don’t try the one step… but I am suggesting you become so confident with this maneuver that you can do it under any hardship. If you can access some slanty walls or set up some wooden triangles or something, it’s worth practicing all 3 approaches. Develop that muscle memory so that if anything starts to go wrong you don’t end up in the drink… cos potentially 30% will fall on this obstacle. Example of the Two Step – not ideal. Please let us know if there are any obstacles you’re particularly interested in. → Watch Channel 9 from 7pm to find out when Australian Ninja Warrior premieres!